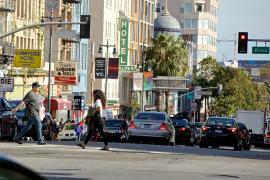 Mayor London Breed is telling The City’s transportation agency to hurry up on two major streetscape projects. A long-awaited bike lane on Townsend Street near Caltrain and the controversial Sixth Street Pedestrian Safety Project will be expedited at the Breed’s direction, The Mayor’s Office told the San Francisco Examiner on Wednesday. “I have been personally reviewing Vision Zero projects on our high-injury corridors to determine which projects can be implemented more quickly, because we cannot wait any longer to ensure the safety of pedestrians and bicyclists on our streets,” Breed said in a statement.